Top 10 Best Wireless Keyboards in India 2019 - Top 10 In India - Only The Best of everything! LATEST product list, updates regularly! A wireless keyboard is great to have, but be warned that you cannot expect it to work flawlessly from any distance. A wireless keyboard has a certain range within which it will work perfectly, go beyond it and its performance will become slightly spotty. 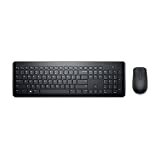 In general if you buy a decent wireless keyboard it will deliver for a long time. All you will need to do is replace the batteries from time to time. And the advantages of a wireless keyboard are many. These are advantages that I have come to realise from personal use. First and foremost, the wire is gone, you will no more need to tug and adjust the wire and be careful where you are placing the keyboard. That means if you want to shift from the table to your lap or to the bed, you are good. As long as it is within a few feet of the wireless sensor. You can literally type from wherever you like. Sometimes you get tired sitting at the table, just lie back on the bed and type away. Want to push back a bit and keep the keyboard on your knees? Go right ahead, it’ll work brilliantly. Suddenly want to stand up and type, just place the keyboard on a pile of books and type away. Need to clean up the area and put something else in front of the screen. No problem! Just put the wireless keyboard aside, no need to worry about wires or disconnecting etc. Want to put up your feet after a hard day, just balance the wireless keyboard on your legs, voila! Overall wireless keyboards reduce stress while working. Another point is that if you suffer from back pain then a wireless keyboard will help in achieving a good comfortable posture that will alleviate your back ache. #1 Plug the small USB wireless sensor on to the front of the PC so that it is closest to where you will be. If you plug it into a USB port behind the PC tower, then the distance increases and line of sight is broken. #2 Try not to have any solid or metal object between your keyboard and the wireless sensor on the PC. This might cause some connectivity issues. 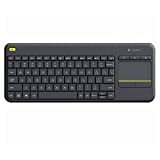 #3 If the wireless keyboard does not have a built-in touch pad, buy a wireless mouse to go with it. The freedom is insane. Fn key gives you quick access to media player, homepage, volume adjustment and etc. 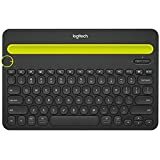 Top 10 Best Wireless Keyboards in India 2019 – The smartest and quickest way to find the best products. Daily updated Top 10 lists. Look, Choose, Buy Smart!